Lord venkateshwara is adorned with white camphor (that looks like a white spot) on his chin. What is the story behind this application of camphor at his chin & what's the significance of this? Anantāḻvār is one of the disciples of Sri Ramanujacharya. After Sri Ramanujacharya has solved the dispute on the identity of the deity on the Tirumala hills, he appointed simhāsanādhipati at that place in the year of 1057 AD. He also appointed one of his favourite disciples Anantāḻvār to take care of the temple administration and daily worship. Ananta was a staunch devotee of his teacher. So he started to live in Tirumala hills along with his wife. Sri Ramanujachrya ordered Anantāḻvār to build a flower garden for the service of Lord Venkateshwara. 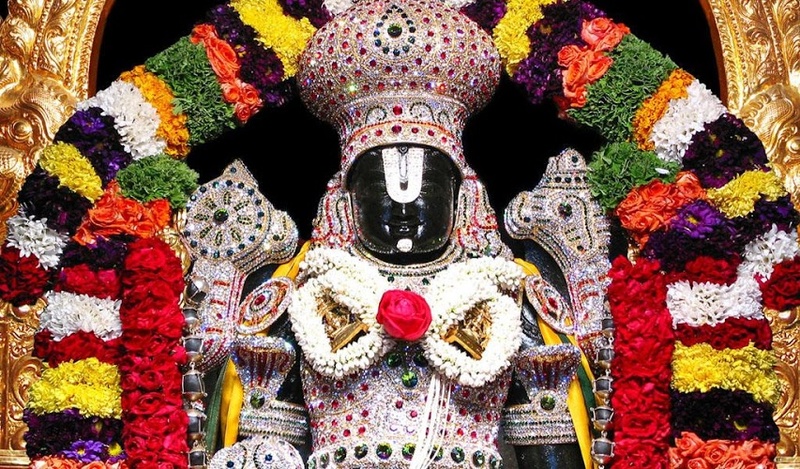 He also told Anantāḻvār that all the flowers in this garden should be grown for Lord Sri Venkateswara alone and all these flowers should be used in the daily sevas and kainkaryams performed to him in the Tirumala Temple everyday. According to his master's orders, Anantāḻvār started building a garden for the Lord's service. As already said, He was a staunch devotee of his guru. So he thought that he should not seek help in achieving this divine task. He said the same to his wife. This is a very divine task our Acharya had assigned to us hence we would not be seeking assistance from anyone outside our family. We must carry entire burden of building this garden for the Lord,on our own shoulders. His wife obliged her husband's orders, the work went on for many days. He engaged in work along with his wife. But it was not an easy task. Tirumala hills were very dangerous back then with many wild animals. The area too was not fertile to build a flower garden. It was a hilly area, wife of Anantāḻvār was pregnant during that time. So Lord Venkateshwara wanted to interfere in the work and help his ardent devotees. After few days, He assumed the form of a child and began to help Anantāḻvār's wife in the work. Anantāḻvār noticed this change and got angry because he didn't wanted any outsiders to interfere in the work assigned to him by his Acharya. He ordered the boy to go away from the site. But the boy didn't listen to the words of Anantāḻvār and continued to help them. Then Anantāḻvār could not control his anger. So he decided to punish the boy for intruding into his land, his work and also into his personal affairs. Out of anger,he threw the crow bar (which he was holding in his right hand) towards the boy. The crow bar hit the boy's chin. After this incident, the boy disappeared from the sight of Ananta. As usual, when he went to the temple for worship , he found that the chin of the main deity is bleeding. It was the time when he realised that the boy who came to help him and his wife is none other than Lord Venkateshwara. He pleaded to lord to forgive him for his folly. He then applied camphor(పచ్చ కర్పూరం in telugu) on the chin of the idol of Venkateshwara to heal the wound caused by him. Camphor reduces the heat in the body and increases coolness. So, this has become a tradition and is being followed even today. Translation of the line: The one who is adored by the scar on the chin which is caused by the sacred crowbar of foremost devotee Ananta which indicates that you are affectionate towards the needy. We can see the crow bar which is the cause of the scar on the chin of Lord Venkateshwara even today. 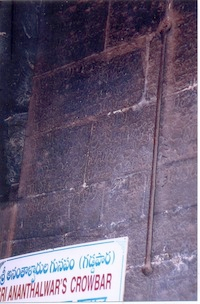 It is displayed on the wall of right side of the main entrance of the temple. The flower garden which was built by Anantāḻvār is still maintained by the successors of Anantāḻvār. It is called as Anantāḻvār's Bṛndāvanaṃ. We can visit that garden too. A seva is performed at this garden by Tirumala Tirupati Devasthanam(TTD) every year as a honour to the great devotee Anantāḻvār. This is called Purusaivari Thototsavam. Lord Malayappa visits that place during this seva. Not the answer you're looking for? Browse other questions tagged vishnu venkateshwara tirupati . Why are there no more Alwars?